Vertical Consultants believes there are three basic things every property owner should consider when it makes a decision regarding its cell tower or rooftop lease. First, a cell tower lease or rooftop lease is more a telecom transaction than a real estate transaction. The telecom companies take this prospective to maximize rents when they are leasing their property to other telecom companies, and so should you as a property owner leasing space for cell tower or roof top equipment. Next, never assume you are being paid correctly, in fact you are most likely being underpaid. The truth is thousands of property owners are currently being underpaid for their lease and don’t realize it. Left uncorrected, you’ll be losing out two-fold, one for what you should have been paid in the past and secondly for what you should receive going forward. Lastly, the true value of your cell tower or roof top lease is ultimately based on the value of your site to the telecom company leasing your property. Don’t be fooled, in most cases the telecom companies need you more than you need them, but the certainly don’t make you think that is the case. As a property owner, when you arm yourself with the ability to determine the true value of your site, you will be better equipped to determine the proper rent of any current or proposed lease. We work with our clients to make sure they have not only the information they need, but understand all the options available to you when it comes to your lease. We invite you to take the next step and contact us today. We provide a free, yes I said free, review of your lease to see what options you may have, and ultimately we do not benefit unless you our client benefits. Remember the telecom companies looking to extend your lease have experts working for them shouldn’t you? The team at Vertical Consultants are industry experts and master negotiators, put us to work for you, call us at 877.456.7552 today. 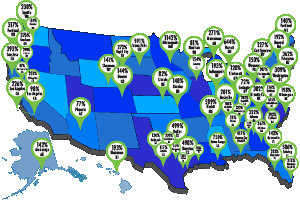 Curious about cell tower lease rates in your area?